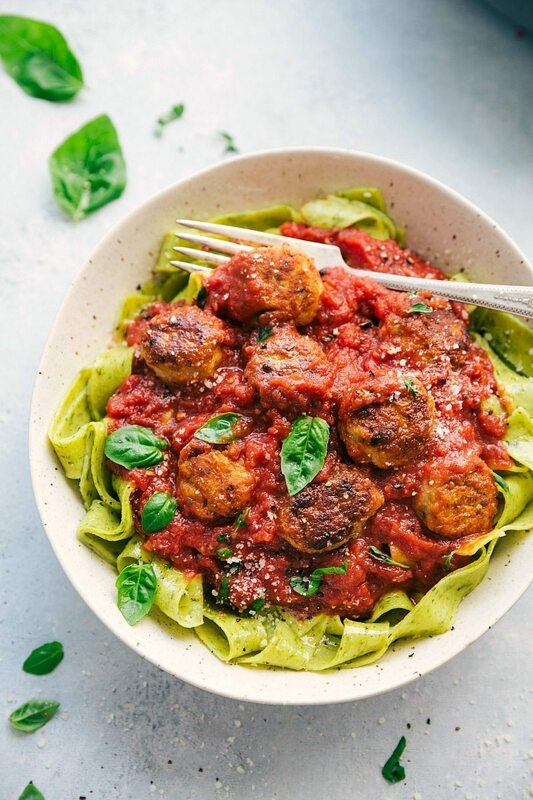 A fun twist on your typical chicken parmesan — now it’s made into delicious cheese-filled meatballs with BUITONI Roasted Garlic & Chive Pappardelle! Chicken Parmesan is one of my all-time favorite dishes and I can’t wait to share this fun twist with you all today! 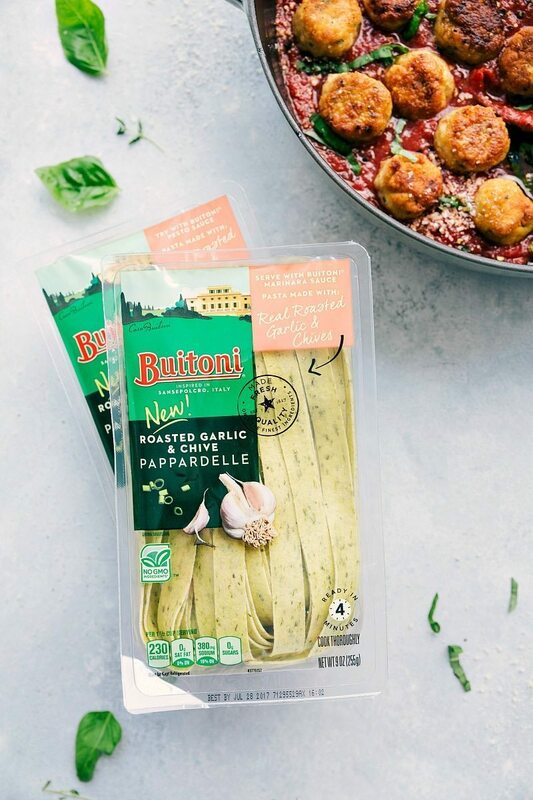 All the flavors you know and love are now in meatball form, smothered in an insanely delicious marinara, and piled on top of the most amazing Roasted Garlic & Chive pappardelle from BUITONI. 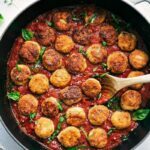 The meatballs are pretty easy to make — they’ve got pretty much all the “meatball” basics, but you’ll use ground chicken instead of ground beef. There are a few extra seasonings to help them resemble chicken parmesan and then they are STUFFED with mini mozzarella pearls. Once you’ve made the meatballs, you’ll whip together a quick and easy marinara sauce. And while the sauce + meatballs get transferred to the oven, it’s time to whip up the pasta. I’m using Buitoni Roasted Garlic & Chive Pappardelle pasta which is insanely good! These freshly made, wide cut and flat pasta ribbons are made with REAL roasted garlic and chives that have been infused into the pasta dough. All while keeping away from any GMO ingredients. I love this dish because every piece of it is infused with flavors from the meatballs to the marinara sauce and even the pasta itself! The pasta is ready in 4 minutes and then it’s ready to top with chicken parmesan meatballs + marinara. And of course, you can’t forget the Parmesan cheese to top it all off! In a large bowl, combine the ground chicken, Panko, parmesan, eggs, dried parsley, dried oregano, onion powder, and red pepper flakes. Add about 1 teaspoon salt and 1/2 teaspoon cracked pepper or to taste. Knead the ingredients together until ingredients are evenly combined. Slice the mozzarella pearls in half. 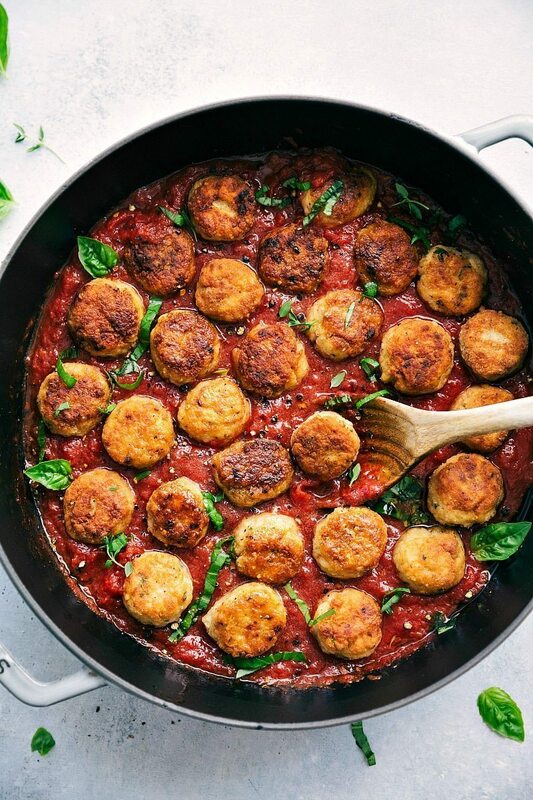 Form the mixture into mini meatballs and insert half of a mozzarella pearl into each meatball. Ensure that the meat completely covers the mozzarella. You should get around 35-40 total "mini" meatballs. Add the flour to a shallow bowl. Dredge each meatball in the flour. 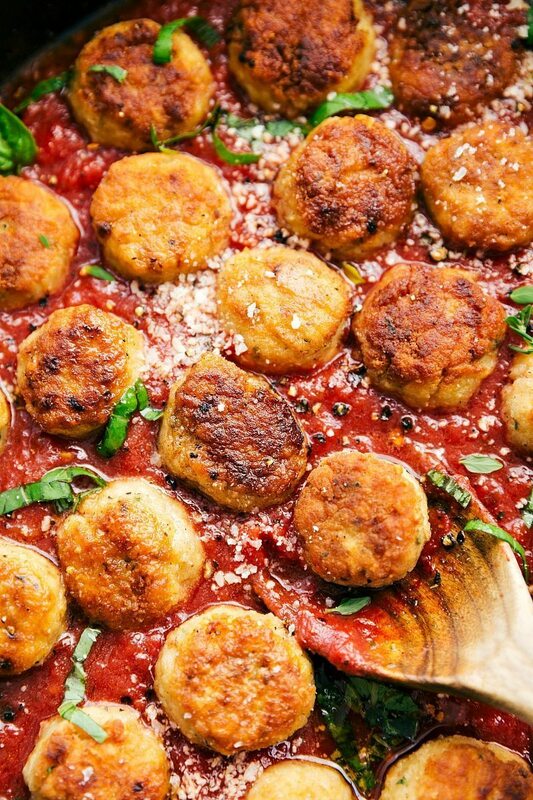 Tap off the excess flour and set the meatballs onto a plate. Preheat the oven to 350 degrees F.
Grab a very large nonstick skillet and add in 1/4 cup of the olive oil. Once the oil is shimmering and hot, add in half of the meatballs. Sauté for 3-4 minutes, turning occasionally, until the meatballs are browned on the outsides, but not cooked through. Remove to a plate. Add in the remaining meatballs and sauté for 3-4 minutes (add extra olive oil if needed). Add the rest of the meatballs back into the skillet. 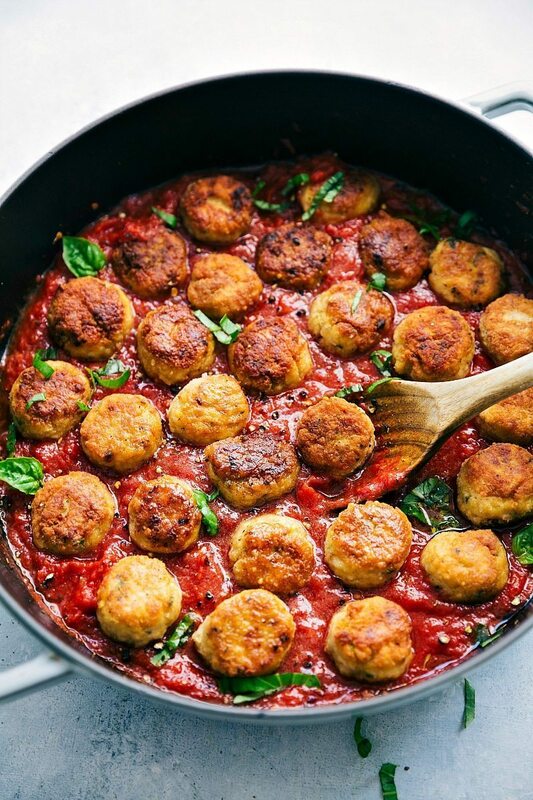 Place the skillet in the oven and bake 15-20 minutes or until the meatballs are completely cooked through. Meanwhile, in another skillet, add in the remaining 1/4 cup olive oil. Once the oil is shimmering, add in the garlic. Stir the garlic for 1 minute and then add in the can of crushed tomatoes. Add 1 cup of water to the can of crushed tomatoes and slosh it around to get all the rest of the tomatoes. Add in that cup to the skillet. Add about 1 teaspoon salt, freshly cracked pepper (to taste), remaining 1/2 teaspoon red pepper flakes, Italian seasoning, and a sprig of basil. Simmer the sauce until the meatballs are finished cooking in the oven. Meanwhile, cook the pasta according to package directions and drain. When the meatballs are cooked through, remove and serve with the marinara over the cooked pappardelle. Top the pasta with fresh basil and freshly grated Parmesan cheese to taste. Season with any additional salt, pepper, and/or red pepper flakes. Special thanks to Buitoni for sponsoring this post. As always, all opinions are my own. This was so tasty – my boyfriend and I loved it. Now that I’ve made it once it will only go so much quicker. So amazing! I just made this, and my hubby and I both loved it. Only change I made was to bake the meatballs in the sauce, after browning them, rather than bake them by themselves. Soooo good!! Hi Chelsea! I made these for a family dinner in November, and they were a HUGE hit!! I am hosting a holiday cocktail party tomorrow and I plan to make these as an appetizer with my homemade marinara AND pesto sauces for dipping. My question is, do you have any make-ahead tips? I am trying not to lose my mind this weekend and am trying to simplify where I can. Can I make these through the flour/ stove top part, or should I just roll them tonight and then flour/ stove/ oven tomorrow? OR, can I do all of it tonight and then what is your tip for re-heating tomorrow? Your help is appreciate because, as you can tell, I’m stressing!